We’re just days away from the start of the fall semester, and I’d like to extend a warm welcome to everyone as you return to campus. The beginning of a new academic year is truly one of the most exciting times on a college campus, and I know the future is bright for Florida State University! 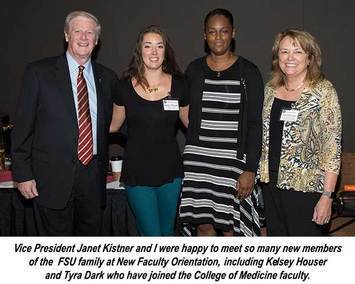 For those of you who are new to our faculty, we are happy to have you on board and a part of the FSU family. It was great to see so many of you at the New Faculty Orientation and reception held earlier this week. I think you’ll find our campus has all of the benefits of a large research university yet still has the feel of a small, tight-knit community. Each year, the quality of our students gets better and better, and I’m thrilled we have another remarkable class of freshmen arriving at FSU. Their average high school grade point average was 4.1, with an average three-part SAT score of 1848 and an average ACT composite score of 28. That’s pretty impressive! You are a big reason why FSU attracts such academically talented students — they want to learn from some of the top educators in the world. I’m also proud to tell you that our freshman class is one of our most diverse. Of about 6,200 incoming students, an estimated 21.5 percent are Hispanic or Latino, 11.3 percent are African-American or African-American and another race, and 2.5 percent are Asian. As you know, increasing the diversity and inclusiveness of our campus is one of my top priorities, and I believe that having a multicultural student body, faculty and staff enriches the academic environment for everyone. You are bringing in millions of dollars in federal research grants every year and putting Florida State on the map as a leader in a variety of fields. This summer, we learned that the Center for Advanced Power Systems was awarded a five-year, $35 million grant by the U.S. Navy’s Office of Naval Research to advance the Navy’s efforts to build an all-electric ship. Did you know that in April FSU became the first university test site accredited by the U.S. Navy to perform high-powered simulations? Pretty cool stuff. 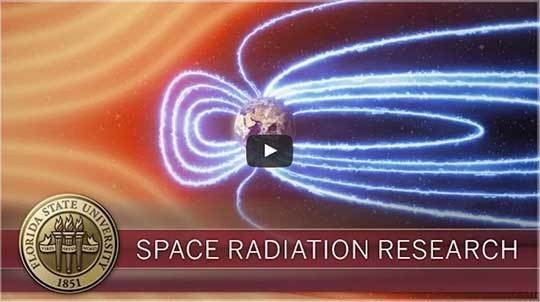 In July, the U.S. Department of Energy granted FSU $10 million to create a new Energy Frontier Research Center that will focus on accelerating scientific efforts needed to support nuclear waste cleanup. The center will be led by Gregory R. Choppin Professor of Chemistry Thomas Albrecht-Schmitt in his one-of-a-kind laboratory, and it will focus on developing technologies for recycling nuclear fuel and cleaning up Cold War-era weapon production sites. This award is a testament to FSU’s leadership in the field of radiochemistry. I’m anticipating that our new faculty members will make an immediate impact on our research enterprise this year. John Lowe, a Cherokee Native American tribal member and one of only 20 Native Americans in the United States who has a doctoral degree in nursing, joined the College of Nursing faculty this fall as the McKenzie Professor in Health Disparities Research. Dr. Lowe, a leading educator, researcher and global advocate of culturally competent health care for Native Americans and indigenous populations, plans to create the Center for Indigenous Nursing Research for Health Equity — the first research center of its kind worldwide. Your groundbreaking research not only enhances the reputation of our university, it plays a vital part in the local and state economy. 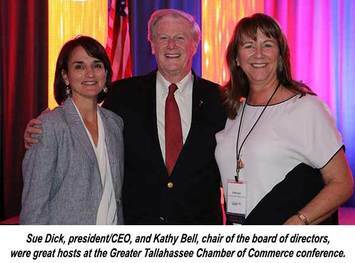 In fact, earlier this month, I addressed the Tallahassee Chamber of Commerce at its annual conference in Amelia Island, and I spoke about that very subject. Did you know that FSU’s annual economic impact is estimated to be about $10 billion? It's not such a surprise when you consider our total operating budget is about $1.6 billion — about twice the City of Tallahassee’s budget and larger than that of 72 foreign countries. A big part of our impact is a result of the research dollars you bring in through contracts and grants and the jobs you help create. Those numbers are staggering and just reinforce what an important role Florida State plays in Tallahassee, the state of Florida and the world. I know the message certainly resonated with the Chamber! The FSU Police and Department of Emergency Management recently launched the new SeminoleSAFE mobile app. It provides everyone on campus another great tool in keeping FSU safe. Make sure to check it out and download it on your device today! Campus is already bustling this week, as students have started moving into their residence halls. Take a second to say hello, shake their hands and welcome them to FSU. This is a truly incredible place to learn and work, and we are fortunate to have the opportunity to make a difference in young people’s lives. Please remember, I love hearing about your research and achievements, so feel free to email me when you have something you’d like to share. Also, I have included some media clips about your top-notch work below. I hope your semester gets off to a great start!